If you feel like no one is listening to you, don't worry. Thanks to Qualcomm, your smartphone may soon soon bend an ear. The chip maker announced Wednesday a new low-powered, always-on listening feature called voice activation for its new chip. It's to be included in the upcoming Snapdragon 800 processor, due out in the middle of 2013. The feature will allow smartphones to constantly listen to surroundings without sucking up too much power, ready to respond to custom voice cues. Since the feature is always on, users won't have to press any buttons to voice command their devices. Either the manufacturer or owners can create custom phrases for the device to listen for like, "Hey, Snapdragon." Then users will be able to talk to their smartphone, even if the device is in sleep or airplane mode. But the new Snapdragon won't listen to strangers, and will only take orders from the device owner. Another Snapdragon 800 feature Qualcomm divulged is Qualcomm Quick Charge 2.0. The technology allows for devices to be charged up to 75 percent faster than devices without the feature. Responsible for the speedy recharge is a combination of a special wall charger and either a standalone integrated circuit solution or the built-in power management system in the Snapdragon 800. The company said the wall charger will fit into existing energy outlets but will be able to provide up to 60 watts of power. However, the Quick Charge 2.0 wall charger isn't expected to be released before 2014, though the new Snapdragon processor will already be compatible with it at launch. The Snapdragon 800 was previewed at CES 2013, with some impressive features. With a new CPU configuration and SMP architecture, it will have some heavy-duty processing power while being very energy efficient. The chip will also allow devices to record and play UltraHD video, take up to 55MP pictures, add multi-channel HD audio and allow for even higher resolution displays (up to 2560 x 2048). And the new Snapdragon isn't just going into phones, the chip can also be installed in Smart TVs, tablets and digital media adapters. A talk-ready TV might just make those hunts for the remote a thing of the past. Qualcomm, perhaps trying to get some new products out in the sweep of news coming from of Sony's PS4 show, revealed specifics for two more chips: the Snapdragon 200 and 400. The 200 is for entry level phones, with a Quad ARM Cortex-A5 CPU with up to 1.4GHz per core and supports HD video playback, up to 8MP pictures and highly accurate GPS. The Snapdragon 400 is meant for high volume smartphones and tablets. It has a few CPU options with either a Dual Krait processor running up to 1.7GHz per core or a Quad ARM Cortex-A7 with up to 1.4GHz per core. It also features an Adreno 305 GPU for high-end 3D gaming, support for better wireless connections around the world, and has faster and more energy efficient RAM. 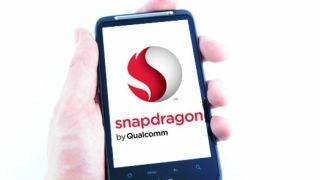 The Snapdragon 200 and 400 are expected out sometime this year, and the Snapdragon 800 is due to come out sometime in the middle of 2013. After that, you might want to watch what you say around your smartphone.